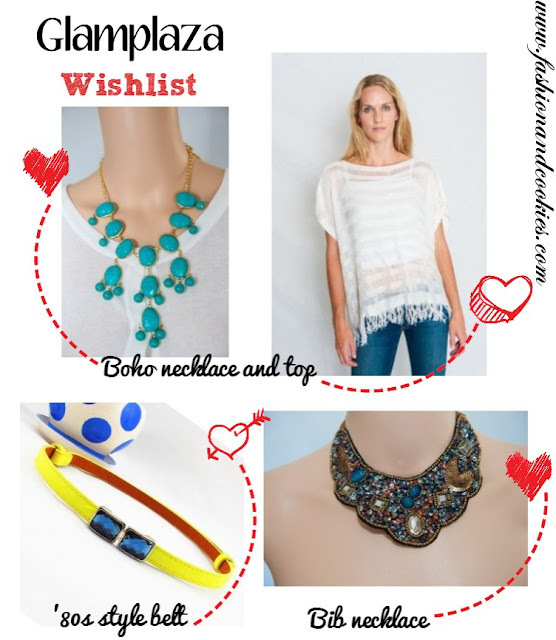 Glamplaza is a newly launched portal, specialized in online women’s fashions and clothing retailer, aimed at researching and selling top quality clothing, accessories and jewelry. The good news is that they are also pretty affordable !. In the image above you can find my top picks of the moment, I do believe in the power of accessories and these ones are really pretty and have also a good price. What is your favorite item ?. I have the boho necklace, you saw it in a previous outfit post, but in case you do not have it yet, I suggest you to get one 'cause they are statement pieces that can turn a dull outfit into a special one !. Also, I am loving that yellow belt so much, and I have a collection of bib necklaces, this one is totally gorgeous !. This lovely webshop also sells many beautiful clutches, to add a statement bag to a special outfit or just to spice up a casual one (moreover, they have a wide selection of transparent clutches, something that has been and still is very trendy at the moment, they have perspex clutches in many different colors and I confess I'd buy them all !). 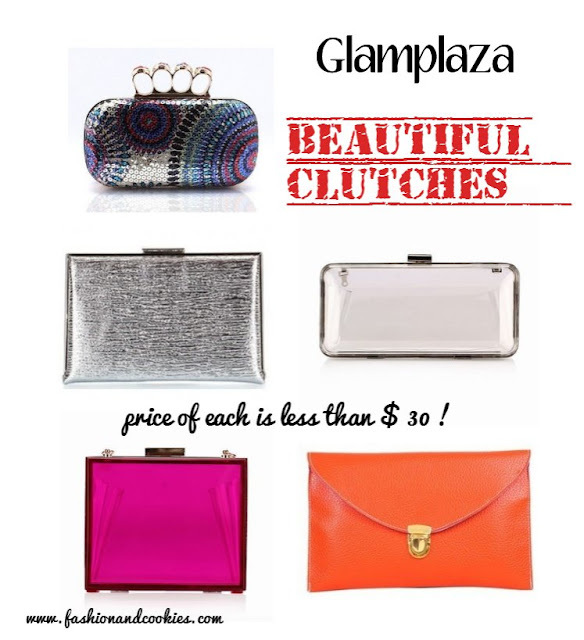 The clutches I selected are all less than $30...looking much more pricey instead !. They deserve to be checked out !. At Glamplaza they also sell dresses, beach covers, skirts and anything for fashion enthusiasts. Isn't the striped dress below so cute ?. How would you style it ?. I'd go for a white pair of Converse sneakers to add a rock vibe to the look. The shipping on Glamplaza is FREE for all USA orders. Moreover, if you wanna buy something from this website, you can now have a special discount code, only for readers of Fashion and Cookies !. 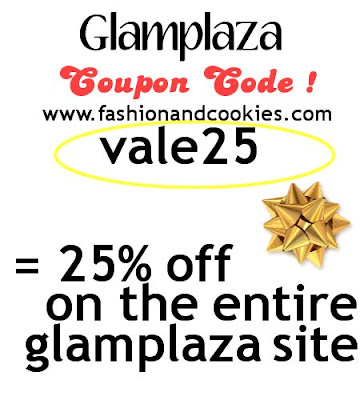 If you digit vale25, you can have a special 25% discount on everything you order ! Isn't it great ? Prices are already very good, and this coupon code is a juicy chance to order something pretty for a super low price !. Glamplaza is also connected to a Facebook page you'd want to check out !. You are welcome to browse around and let me know your favorite item ;). Ciao Vale, non conoscevo questo portale ma mi sembra decisamente interessante. I should definitely have a look!!! Pretty clutches! Love them all. 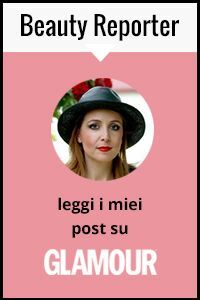 Ci farò una visita, sembrano molto carine le cose! Very nice and beautiful necklaces! Non lo conoscevo e forse era meglio cosi'! Se sfodero la mia carta di credito sara' colpa tua! Such lovely items! Those clutches are beautiful. Also you look adorable in the post below! Un nuovo covo di delizie!! Mi piacciono soprattutto gli accessori. Grazie per il coupon!